I can't believe it's already September. Seriously - where did summer go? I hope you're all enjoying your long weekend. I've been trying to work on some painting projects, but some unfortunate hiccups has made finishing everything on my to-do list this weekend rather impossible. If you follow me on Instagram you've seen some of my setbacks. If I'm lucky I'll hopefully get a bit more accomplished today. September, like most people I expect, always me think of back to school. It's been a rather depressing number of years since I've experienced the nervousness and excitement of the first day back at school after summer vacation, but I will be continuing with my Interior decorating courses this fall, so I suppose that means I'm heading back to school too. When I return to class I'll be doing my homework on my dining room table, but I really wish I had a big house so I could have a designated office/work area. I'm rather in love with this work space. The desk isn't large, but I love how there is loads of storage all around for books and hiding away all those 'important papers' which pile up at an alarming rate. The space is part of a whole home renovation done by Jessica Helgerson Interior Design. You can see more of the home here. This bright and airy space is lovely. 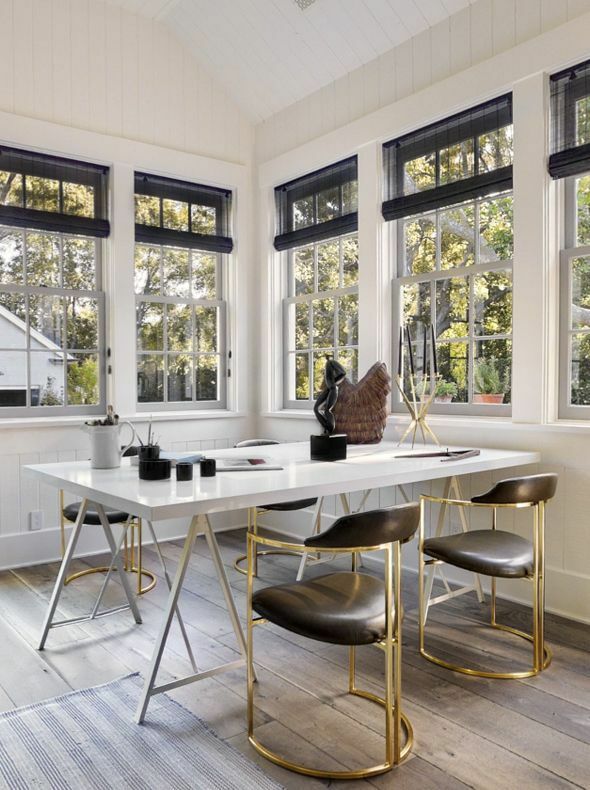 Can you imagine doing homework or working on your latest project while surrounded by all those windows? This room was part of the House of Windsor - a home designed by Windsor Smith and decorated by several designers for Veranda magazine in 2011. You can see more of the home here. Do you have a home office/work space or do you use another area of your home for homework, working on projects and paying bills like I do? If you don't have a work specific space do you wish you did?